A dramatic and emotional story about one girl's determination to stand by her beloved animals - and her refusal to give up, even in the face of impossible odds. When a devastating earthquake hits Evie's hometown of Parnassus on New Zealand's South Island, she and the rest of the town are forced to evacuate. Evie's injured mum is one of the first to be rescued by helicopter and Evie will be next. 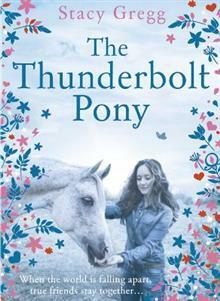 But when realises that she will be forced to leave her beloved pony, Gus, her dog, Squirrel, and her cat Moxy behind, she is determined to find another way. Before the rescue helicopter returns, Evie flees with Gus, Squirrel and Moxy in a race against time across difficult terrain to reach the port of Kaikoura, where she has heard that people will be evacuated by ship in three days' time. Surely there will be space for her, Gus, Squirrel and Moxy there? But the journey is harder than Evie could ever have imagined, and with aftershocks constantly shaking, Evie will have to draw on all her bravery, strength, and resilience to bring her and her animals to safety ...and hope that they reach the boat in time.